As we celebrate the feasts of our dear Carmelites, Our Holy Mother St. Teresa of Jesus and St. Thérèse of the Child Jesus, we rejoice in the blessings sent our way this past summer, to our Carmels of Jesus, Mary, and Joseph here in the diocese of Harrisburg. 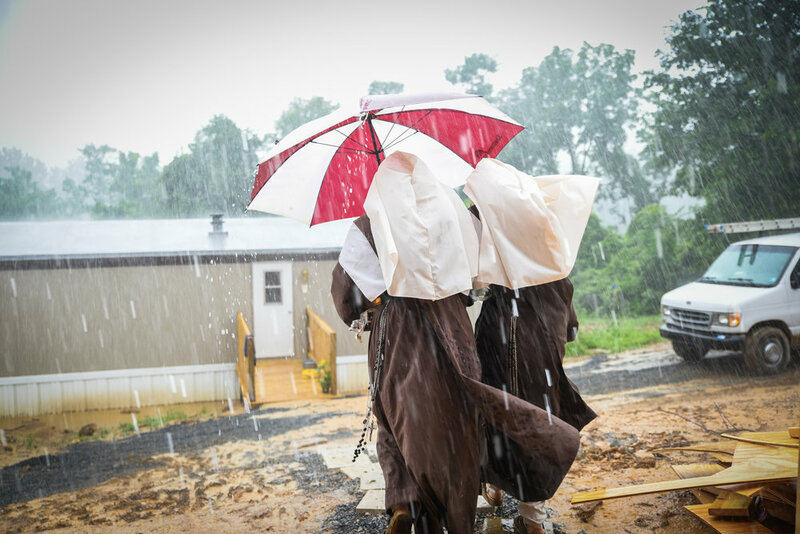 After a beautiful and moving Holy Mass and enclosure ceremony on July 25th, nine of our Nuns are happily established at their new home in Fairfield. With a lot of hard work and sacrifices from our friends old and new, our families, caretakers, and our construction team, the move went smoothly despite an almost constant downpour. The unseasonal record-breaking rainfall was a sign to us of all the graces that God has and will be pouring over this new little Carmel. There has been significant strides forward with the construction. A successful stone laying workshop, followed by a timber-framing workshop has produced a lovely 20 x 30 woodshed. It is particularly monumental in that it is so constructed entirely from stone excavated from our own property. Presently a second stone structure is being built, slowly but surely. Its stone foundation is impressive: three feet thick with the stone at intervals spanning its entire width. The language of the solidity and permanency as well as the humility of the rough stone speaks to our hearts of our precious faith and reminds us of our role in the Holy Mother the Church, silent and hidden below the surface, committed to fidelity until the end. In Elysburg, the observance of the monastic life continues with fervor. Young women keep knocking at the door and the community has welcomed two new postulants since the foundation to Fairfield was made in July. Construction is also underway for the building of a new barn, a gift from a very generous benefactor, as well as an enclosure fence which will include the new barn, St. Joseph’s grotto and the pond, now making these areas accessible to the nuns. How grateful we are to God for His many blessings and graces! May He reward abundantly all of our friends and benefactors. We shall keep each one of you in our prayers, especially during the Novena to St. Thérèse of the Child Jesus, September 25 - October 3, and St. Teresa of Jesus, October 7 to October 15.